Lightly brush the steaks with the olive oil. Place the balsamic vinegar, thyme and some salt and freshly ground black pepper on a plate. Gently press the steaks into the vinegar mixer to lightly coat them. Place the steaks on the barbecue and cook for 4 to 5 minutes on each side for medium. Remove from the barbecue, cover and allow to rest. Place the sliced ciabattas on the barbecue, cut side down, to lightly toast them. Spread a little mayonnaise onto the base of each ciabatta. Layer with some salad leaves and sun-dried tomatoes, then add the steak. 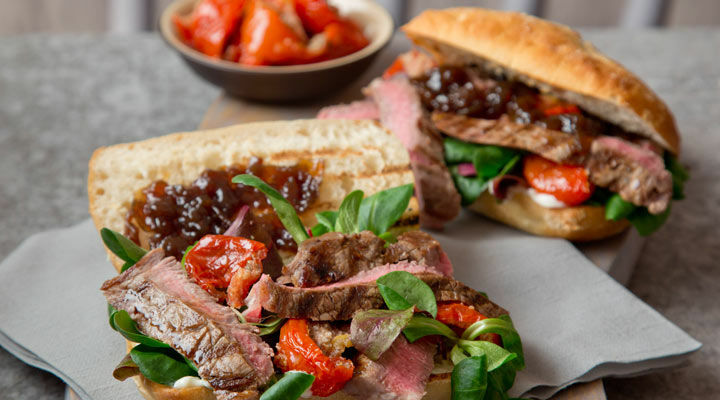 Top with some SuperValu Signature Tastes red onion marmalade and serve.